Whether you're a championship barbecue competitor or simply a novice smoking enthusiast, Leisure City has the grill accessories for you. We offer the best rubs & sauces, lump charcoal, and fire starters. Three Little Pigs Barbeque is regarded by many as the best Kansas City barbeque they've ever tasted. After winning and placing at barbeque contests all over the United States, Three Little Pigs Barbeque has decided to sell its award-winning barbeque to the public. Old World Spices & Seasonings has developed a program using some of the BBQ industry's best known, great tasting rubs and sauces. Original Juan has been creating specialty sauces, salsas, snacks and dips for wholesale, retail and co-pack/private label customers since 1998. Light your fire in seconds - without using lighter fluid The Looftlighter® is the fastest, cleanest, safest and easiest method for lighting your barbeque grill or wood fireplace. 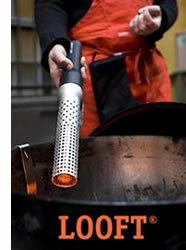 The Looftlighter® ignites wood or charcoal in less than 60 seconds with its patented hot airstream process. The Good-One Natural Hardwood Lump Charcoal contains chunks of kiln-fired Pecan, Hickory and Oak trees harvested from Central Missouri hardwood forests. 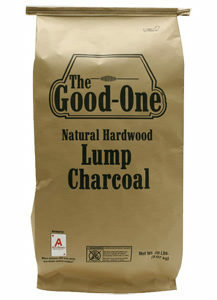 The Good-One Natural Hardwood Lump Charcoal lights in half the time of ordinary briquet’s. It’s only 10 minutes from lighting to 900-degree cooking. Good-One Natural Hardwood Lump Charcoal burns hotter and drier, caramelizing the natural sugars in food and sealing in flavor and moisture.